In this lesson, we will learn how to find the limit of a function as it approaches a certain value graphically. Given that the following graph represents the function 𝑓 ( 𝑥 ) = 𝑥 − 4 𝑥 + 2 2 , determine l i m 𝑥 → − 2 𝑓 ( 𝑥 ) . Use the graph shown to find l i m 𝑥 → 2 𝑓 ( 𝑥 ) . Using the graph shown, determine l i m 𝑥 → 3 𝑓 ( 𝑥 ) . Using the following figure, determine the limit of the function as 𝑥 → 0 . If graph shown represents the function 𝑓 ( 𝑥 ) = 𝑥 − 3 , determine l i m 𝑥 → − 1 𝑓 ( 𝑥 ) . Determine l i m 𝑥 → 0 𝑓 ( 𝑥 ) using the graph below. Using the graph representing the function 𝑓 ( 𝑥 ) = ( 𝑥 + 3 ) + 2 2 , determine l i m 𝑥 → − 3 𝑓 ( 𝑥 ) . Determine l i m 𝑥 → − 3 + 𝑓 ( 𝑥 ) . 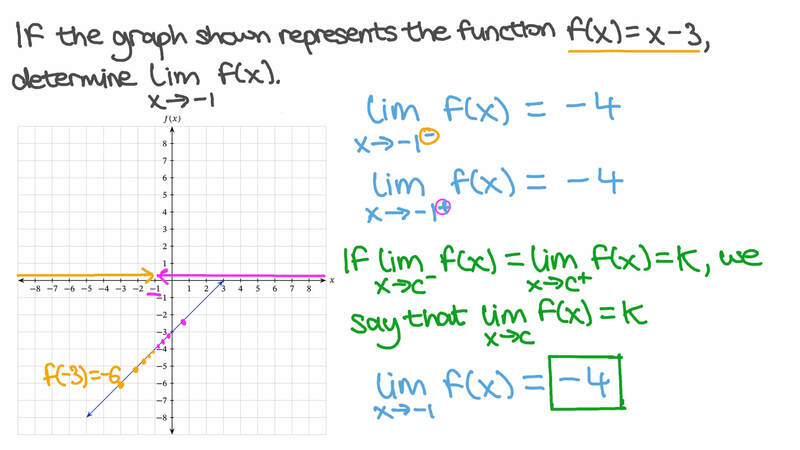 Determine the limit as 𝑥 → 3 of the function represented by the graph. If the following graph represents the function 𝑓 ( 𝑥 ) = ( 𝑥 − 1 ) − 3 3 , determine l i m 𝑥 → 1 𝑓 ( 𝑥 ) . Determine the limit of the function as 𝑥 → − 3 . Determine l i m 𝑥 → 2 𝑓 ( 𝑥 ) if it exists. Determine the limit of the function as 𝑥 → 1 . Find l i m 𝑥 → 5 𝑓 ( 𝑥 ) . Determine the limit of the function as 𝑥 → 1 , if it exists. 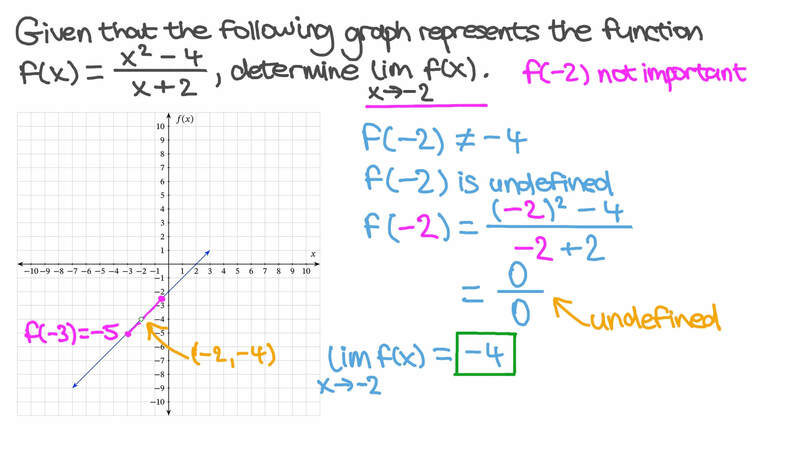 Determine the limit as 𝑥 → 2 of the function represented by the graph. Determine l i m 𝑥 → 0 𝑓 ( 𝑥 ) , if it exists. Determine l i m 𝑥 → − 3 𝑓 ( 𝑥 ) , if it exists. Determine l i m 𝑥 → − 2 𝑓 ( 𝑥 ) , if it exists.